With the 35th overall selection of the 2016 MLB Draft, our Cincinnati Reds selected Taylor Trammell.Ã‚Â His last name is pronounced “truh-mell,” not like Alan Trammell.Ã‚Â This competitive balance pick exists because the Reds are in one of the 10 smallest markets. Trammell was a high school outfielder from Mount Paran Christian School in Kennesaw, Georgia. You may recognize the name of that town of 32,000.Ã‚Â Tyler Stephenson, last year’s #1 pick, also went to high school in Kennesaw. Trammell is listed at 6-feet-2-inches and 195 lbs.Ã‚Â He looks very athletic with that build.Ã‚Â In fact, he was also a great high school football player who came within 650 yards of reaching Herschel Walker’s Georgia state record for rushing yards. The outfielder is a potential five-tool player. His best tool is his plus-plus speed. That will help him both in the field and on the bases. HeÃ¢â‚¬â„¢s got the speed that should play quite well in center field where he projects to be an above-average fielder. His arm is fringy-average, but should play in center field and has improved over the last year after putting in plenty of work to get it to that point. At the plate Taylor Trammell shows off good bat speed and has started to show average to slightly above-average raw power. HeÃ¢â‚¬â„¢s 6Ã¢â‚¬Â² 2Ã¢â‚¬Â³ and 195 lbs, so he may be able to tap into that size and utilize the bat speed to hit 15+ home runs, which would play quite well as a center fielder. Entering the year there were some real concerns about his pitch recognition skills, but he made strides at the plate in this regard as the season moved forward. He still needs to continue to improve in this area, but he showed signs that he was starting to figure it out in 2016. 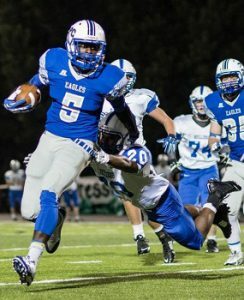 HeÃ¢â‚¬â„¢s an outstanding athlete and was the football player of the year in Georgia where he scored 36 touchdowns. As a big-time football player heÃ¢â‚¬â„¢s behind the curve when it comes to experience on the baseball field compared to a majority of the players in this high school draft class. The MLB Network crew all liked this pick, with one of the analysts remarking “the Reds are having a good draft.”Ã‚Â Ã‚Â He was described as a “five tool” player by another analyst, agreeing with Doug Gray’s assessment, of course. In his intro video, he showed some of his personality, saying he liked Taylor Swift and singing some of the chorus to her hit Bad Blood.Ã‚Â My wife also likes Taylor Swift and has declared Taylor Trammell the next Joey Votto.Ã‚Â I’m not sure my wife could identify that Votto is not a center fielder. He seems like a nice kid and I like the pick!Ã‚Â Going college bat and then high school bat is exactly what I wanted to Reds to do.Ã‚Â I’m a happy camper so far.Ã‚Â Then again, it’s hard to dislike a high school bat.Ã‚Â They all put up crazy stats and it is impossible to know how they’ll turn out.Ã‚Â Hope springs eternal. He was two hopping throws home from short right field in the video I saw. Not exactly 5 tools. That said, I really like his swing and think he’ll stick in CF. Great pick! Thankfully, arm is by far the least important of the 5 tools. Great athlete. I think it was Georgia Tech that Trammell signed with to play football. Ga. Tech has had a vaunted rushing attack each year. A few years of seasoning from some full-time baseball and we might have a CF stud on our hands. The arm might come around some with that. I thought I had read that he committed there for baseball? Hopefully the Reds have done their homework on the three top guys and know they are signable because all three have the option to be in college next season versus signing. 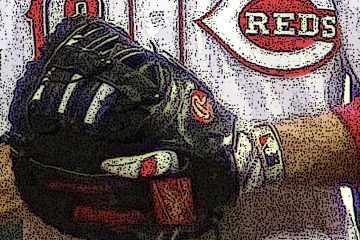 Maybe the money the Reds appeared to be saving by drafting college Srs with no negotiating leverage in rounds 3-10 will be redirected to paying the top guys over slot if need be. I just don’t like the term “potential 5-tool player”. That tells me this player doesn’t have the 5 tools yet and, thus, needs to develop some. And, apparently, an important one for him is batting (you can’t steal first). I just haven’t heard any numbers of his from batting. Only that he struggled then got better through the season. Just what did that end up being? I’m also not so sure how this pick adds up when we have Hamilton in the OF right now. From what I can tell, this guy is Hamilton. I just hope his bat develops. He’s suppose to be a smart kid. That’s for academics, though. I want to see him use some of that in learning how to hit better. I’m not concerned with HR’s. How about someone who can get on base? It will be some years before he is Hamilton for the Reds, by which point he might be the only Hamilton on the Reds. I’ve seen Taylor play since he started as a 9th grader in high school. He hit second in his high school line up 9th and 10th grade behind Jake Palomaki who now leads off for Boston College. Taylor had 40 rbi in 9th and 42 in 10th grade year. Was moved to lead off spot jr. and sr. year. OBP was .680 and .650 both years. Great knowledge of the strike zone, patient, walked 25 times in 28 games with only 7 K’s in over 100 plate appearances. 26 RBI out of lead off spot sr. year in 28 games. 45 runs scored. He has crazy instincts on the bases, not just stealing, but taking advantage of lazy outfielders and people not covering bases. Cincinnati will love his style of play; sprints out of the dugout and plays every pitch with intensity and passion. Great person, teammates love him. Spare time at school goes to the cafeteria and hangs out with the little kids reading and telling knock-knock jokes. He and his brother Kyle ( D1 linebacker at Mercer ) are legendary at MPC for their high character and giving back to the community. Awesome family! Cincinnati scored big here! With Tyler Stephenson and Trammell’s schools less than 2 miles apart, this area has become Reds country 10 miles from the Braves new stadium! 72 AB – 37 HITS – 7 2B – 3 TRP – 9 HR – 26 RBI – 25 BB – 7 K’s – 6 HBP – 45 RUNS SCORED – 29/29 STOLEN BASES – .514 BA – .650 OBP. Too many WEB GEM catches to count! Let’s hope 3 or 4 of those “5-Tool” attributes make it to the show. Loving everything I’m reading about this kid. Super high character, 4.0 student, both parents are engineers so brains run in the family. Sounds like he made a lot of contact, albeit you never know the level of competition these kids face, but it sounds like he didn’t swing at bad pitches with only 7 K vs 25 BB. Give him the next few years focusing just on baseball with no more football to play and I’m confident his arm will be just fine in CF given all his natural athleticism. 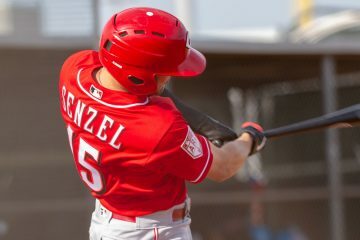 I like the aggressive assignment to Billings, and being around patient hitters like Senzel and Okey to start his career can only be a good thing. I can’t wait to see him play in Dayton next year where he’ll likely spend the entire season.